There is an old saying in the security industry that compliance does not always equal security. Point being that you can be completely compliant and still have not enough or compromised security. In fact, over the last 15 years, many companies have proven this to be true. As an example, a company as large as Heartland Payment Systems epitomized this perspective in the late 2000s. Their security breach was one of the largest at the time. And subsequently, they discovered that compliance and security were not always congruent. This occurred much to their dismay, as they had previously been found to be in compliance with the PCI data standard. Therefore, and unfortunately, in their case, just being compliant did not t equate to excellent security by any means. While the perspective of compliance not equating to security has some general merit, so too does the opposite in some cases. As an organization, being compliant with security regulations can reasonably increase security. If the intent is to be compliant as a way to better their business, it very easily can assist in better security. With the intention of being compliant and increasing security, the organization will be less likely to take short cuts in order to become compliant and will likely look to embed systemic processes for security. For those organizations that want to handle this conundrum correctly, these are the four reasons why compliance will be good for your business. 1) Increase Customer Confidence – Being compliant with relevant security regulations will increase customer confidence. Your customers know that their data could be at risk by working with your organization. If they can see your willingness to take on the challenges of compliance, increased confidence will follow. More importantly, if your organization can talk fluently with your customers about your compliance activities, they will gain confidence in what you do and will do moving forward. Instead of there being a check box, your team is immersed in the regulations, what they are, why they are there. If you can talk to your customers in depth about why and how you have become compliant, you only increase your value-add to their business. 2) Better Internal Processes – If your organization is taking compliance and security seriously, it is likely impossible that you will not to be forced to improve your internal processes. Over time, many of the regulations have been designed to put systems in place for improved security oversight. That is, if you frequently check that your systems are tightened down in regular intervals (hopefully very short intervals). You’ll likely review potential issues more frequently, and you’ll be able to communicate security concerns across the organization. Compliance can be leveraged so that teams are brought together in order to focus on a common goal – a clean audit. The long-term benefit is, of course, the processes that carry on beyond an audit. 3) Competitive Differentiator – Many organizations have leveraged compliance as a competitive differentiator in terms of security. They have used compliance as a way to convey to customers that they are more dedicated to keeping your data secure and that should be reason enough not to work with their competitors. In some industries, this can serve as a competitive advantage. The extra cost and time of compliance the organization provides can be positioned as ultimately better suited to a customer’s needs. 4) Reduced Legal / Regulatory Issues – Focusing on compliance can also result in less legal and regulatory issues. Hopefully a focus on compliance does lead to better security and reduced chances of suffering a breach. Avoiding the legal and regulatory issues can help eliminate the expense of communicating a breach, dealing with the inevitable lawsuits, and the massive internal clean-up that results. While being compliant does not guarantee your organization won’t be breached, it is a step towards taking the security regulations seriously. And, as detailed above, if your organization has the right mindset and intent, it can move towards better security. 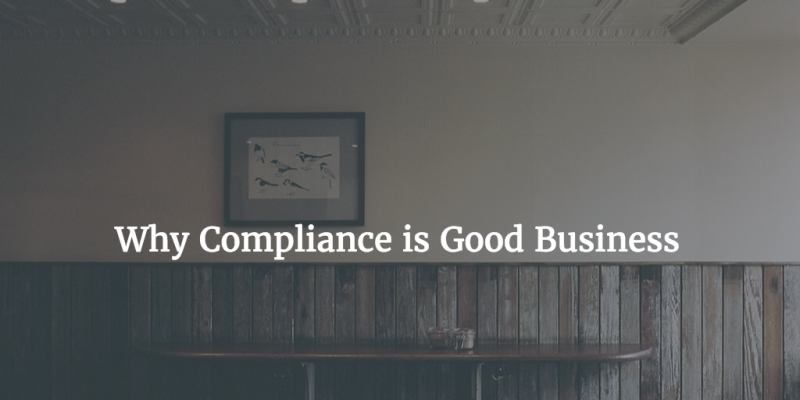 Not every company is subject to compliance regulations, but many are. If your company is, embracing the difficult task of being compliant, use it as a competitive weapon to improve your business. It just might end up making you and your team better which is usually rewarded with more business!